The new Odyssey Menu in the La Reserve by Wine Spectator tasting room on Marina and Riviera pairs the gourmet courses with fine wines from around the world. Highlights of the new menu include Maine lobster cassolette with tarragon and sea urchin bisque paired with Mer Soleil Chardonnay from the Santa Lucia Highlands in California. Another pairing features portobello mushroom risotto with smoked ricotta and black truffle accompanied by the Tenuta Guado Al Tasso Il Bruciato from Bolgheri, Italy. These special dinners are limited to 24 guests, so reservations are required. The Odyssey Menu costs $95 per person. The new wine by the bottle package, available across the fleet, includes more than 50 bottles selected by master sommeliers. Among the selections are The Hess Select Cabernet Sauvignon, Rodney Strong Sonoma Sauvignon Blanc and Domaine Saint-Roch Vin de Pays.The package is priced at $42.50 per bottle, including gratuities, when seven or more bottles are purchased. The Insignia’s upcoming 180-day voyage departing in January, will feature several guest chefs, including Chef Olivier Desaintmartin of Philadelphia’s French bistro Caribou Café and Jean-Louis Dumonet, executive chef of The Union Club in New York City and president of the Maîtres Cuisiniers de France. The chefs will host cooking demonstrations, Q&A sessions, and other culinary events. 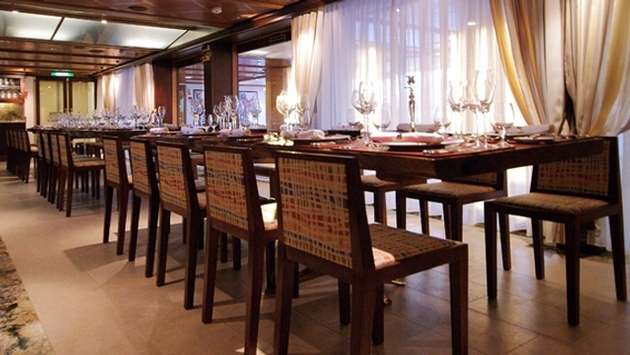 Plus, the the Grand Dining Room will spotlight a signature dish by each chef.